Bluesfest is getting close to 90% sold out! Are we only a little over 2 weeks away from our 27th Bluesfest? Unbelievable, but it's true! After all this time, all these months counting down and creating the artist lineup over many announcements (true to Bluesfest tradition) – this years Bluesfest is now just around the corner. Oh yeah! Bluesfest is about the music, but it's also about fun, companionship, enjoying life, spending time in the most beautiful place on earth and being happy! We are now getting close to 90% sold out BUT the excitement does not stop there - the very first of our international artists are arriving this week for their sideshows around Australia & New Zealand, before making their way to Byron Bay over Easter. How good is that? Read more about all our Bluesfest Tours further down! Before you scroll down - do STOP right here and enjoy this teaser video (below) on what Bluesfest 2016 is all about, it gets us so excited for the festival and really confirms that Bluesfest is the only place to be this Easter! Our international artists are arriving and the festival site is coming to life! 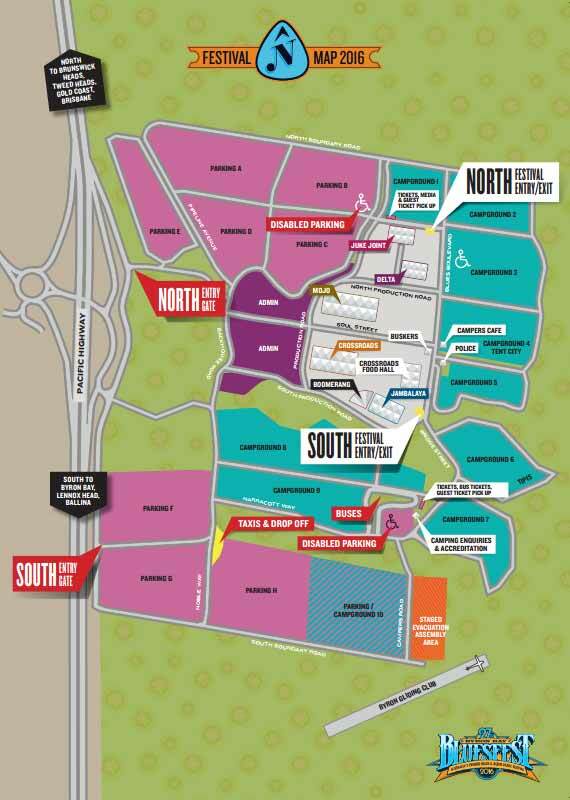 As our ARTISTS are starting to arrive in the country, we have also stepped up the pace on the festival site, where your Bluesfest town is being built. It's starting to buzz with activity and here are some of our amazing team saying hello. And yes, there is a certain magic in the air which falls on to Byron Bay before and during the festival. It's almost spellbinding.There is already a lot of LOVE going around but it will only be complete, when you, our festival friend arrives. Have you had a chance to check out our festival maps yet? Find out where the new Boomerang Festival precinct is? Where all the stages are located, the stalls, the bars, the car parks, the camping - the everything? So much to look at! 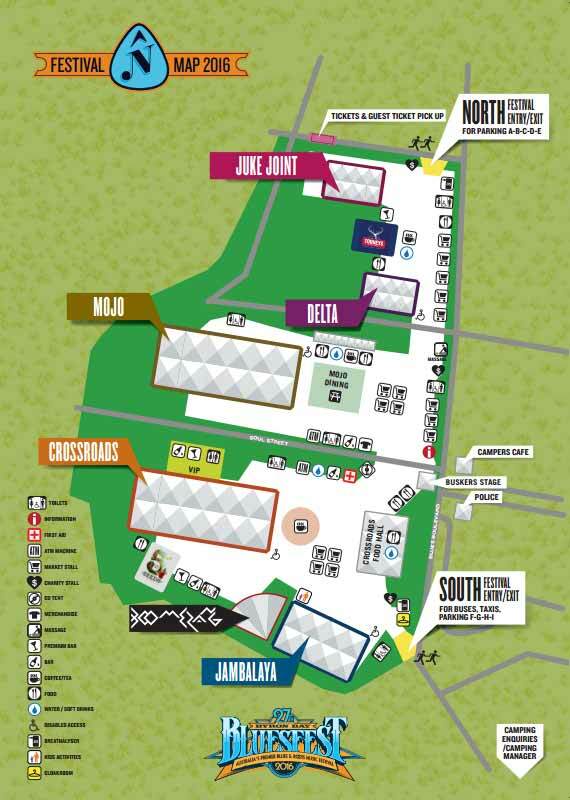 Here are the Bluesfest maps for you! Have you bought your Bluesfest tickets and are all set? If you are still 'ticketless' but know you are coming please know that Bluesfest tickets are a very HOT item, with the opening night, Thursday 24th and Easter Sunday 27th, as well as Easter Monday 28th of March selling at lightning speed. If you are thinking of coming on any of those days - may it be a single day, three days or five, lock in your tickets now to make sure you have your Bluesfest experience secured. Time is now galloping along and tickets are selling VERY FAST leading up to the event. With just 2 ½ weeks until Bluesfest's gates open, the very first of our international artists are arriving this week for some sideshows around Australia and New Zealand before making their way to Byron Bay for Easter. If you can't make it to Bluesfest this year, or are looking for even more amazing live music this March, don't miss these incredible musicians at your doorstep. Kicking off the Bluesfest sideshow season are Mali's Songhoy Blues, all-time favourites Steve Earle & The Dukes, R&B's visionary D'Angelo, Carolina Chocolate Drops' lead singer Rhiannon Giddens and the jaw-dropping supergroup Tedeschi Trucks Band. Bluesfest is so excited to announce that for the first time ever – Levi’s® will be at Bluesfest serving up their denim delights to both festival punters as well as artists from the line-up. The Levi’s® Tailor Shop will be on site across the festival retailing pieces from the latest Levi’s® collection – including iconic styles such as the Levi’s® Trucker Jacket, Barstow Western Shirt, 501® Jeans and Shorts. The Levi’s® Tailor will also be on hand to do any customization and bespoke tailoring – using vintage patches that have been sourced from the US as well as embroidery, vintage fabrics, studding and rip and repair. Be sure to pay the Levi’s® Tailor Shop a visit and grab yourself your own unique festival souvenir, or style yourself in the perfect double denim ensemble that is so on point right now. Your last chance to WIN the ultimate USA road trip! Bluesfest is about the depth of the artists and even the ‘smaller print’ acts on the poster are mind blowing!!! Get ready to have the time of your life at Bluesfest 2016.